The slow boat to the border was surprisingly good, although it was absolutely freezing, I even had to get my towel out to use as a blanket and I fashioned that great look of socks with flip flops. It took about 9 hours each day which seemed to go quite quickly, probably helped by the stunning scenery and our Kindles which have been a life saver on all these long trips. Our overnight stop was in a very small town called Pak Beng, but as we arrived so late we didn’t really get to explore anything. Instead we settled for a local restaurant where we had some very tasty food and then an early night. At the end of the second day, we arrived in Houy Xai which borders Thailand, the only thing separating them is the Mekong River. After another early night, we woke early to start our adventure in the jungle. After a very brief safety video, we were on our way. We were in a group of eight and headed to a small village just outside the National Park where they kitted us out with harnesses; we were then told we had to trek for 2-3 hours (with harnesses on) up to the zip wires. You can imagine my joy when this 2-3 hour trek was all uphill, a real wake up call to how unfit I actually am! We finally made it up to the first zip wire which looked very scary and suddenly the nerves kicked in. We were shown how to break if necessary as some of the zips are faster than others. I managed a 180 spin on my first attempt which was not fun and I came off feeling very shaky. After a few more zips the nerves wore off and I actually started to enjoy myself. The key to a good zip is staying straight and making sure you reach the landing deck. If you stop short you have to pull yourself monkey style along the wire which is really hard work. 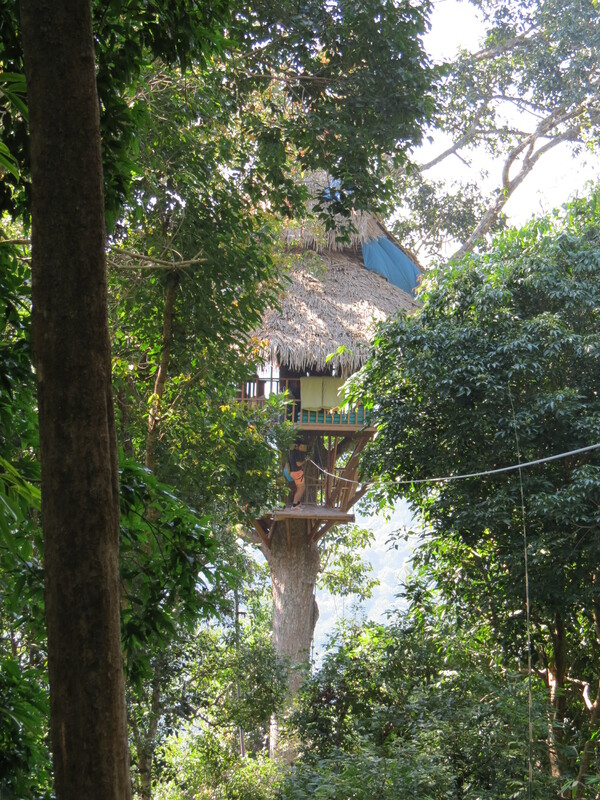 After lunch we were taken to our tree house which was quite amazing and floating 50m in the air. We had to zip in and out of the tree house which was a lot of fun. We each had beds, linen, mosquito nets and even a shower. The toilet wasn’t the best unfortunately, mainly due to the fact we were very close to the ‘Bee Tree’ so the toilet bowl was full of bees. I ended up going to the loo in the jungle as I couldn’t face the bees. 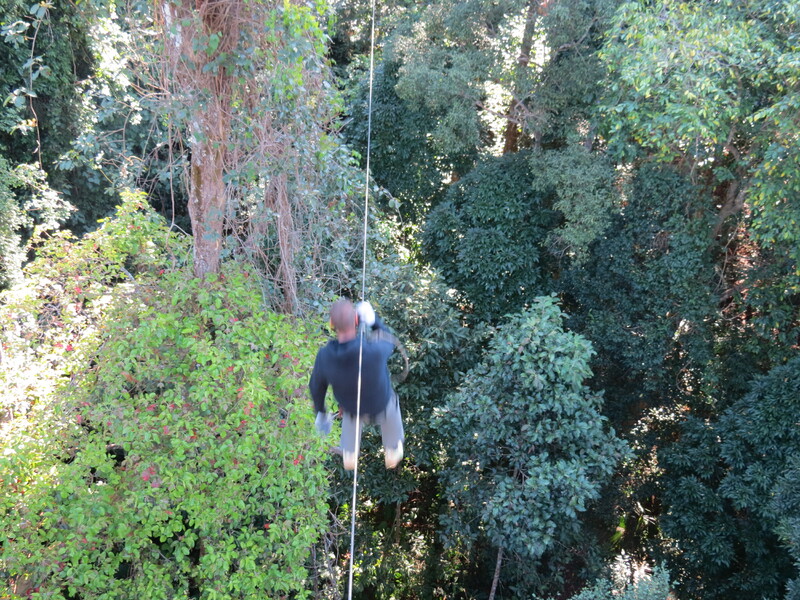 After a short break in our tree house, we were off again to explore some more zip lines. This time we were shown a small loop of zips where we were then basically left to our own devices and told to zip the loop as many times as we wanted. The longest zip we did that day was 700m long and 300m high….quite incredible. Sam got some amazing video footage, some of which we’ve embedded below and well worth a quick look so you can appreciate how high we were. 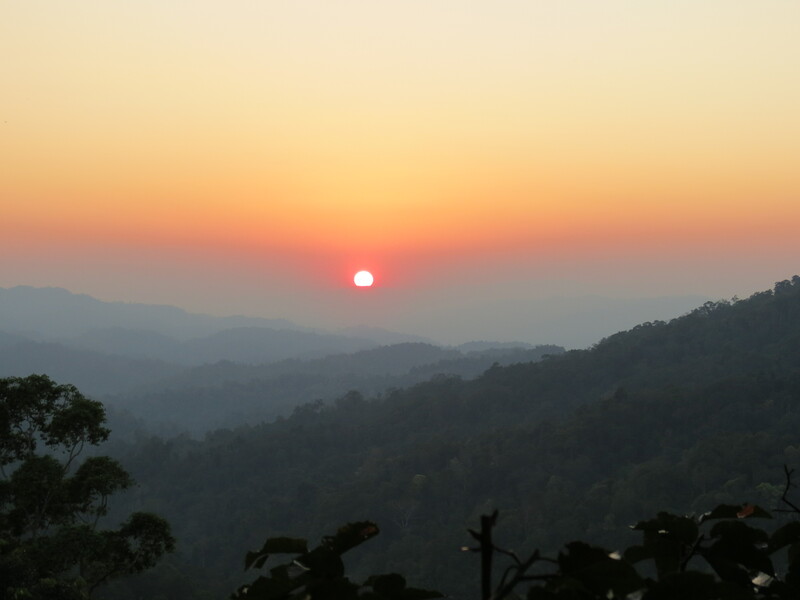 We made it back to the tree house for the most amazing sunset over the mountains. Dinner was then served which was delicious and consisted of a huge mound of sticky rice, some vegetable dishes and two bottles of Laos wine. As the night grew dark, the noises of the jungle were pretty amazing and there was also a lot of rustling above us…rats. We had been told to expect them so we made sure all the food was locked away before bed and escaped to the safety of our mosquito nets. Sam and I had ear plugs which meant we were able to get a few hours of sleep but some of the others in our group said all they could hear all night were the rats moving around. We were woken early and told that we were going on a 2 hour trek to find the Gibbons. I had what Sam might describe as a small strop and just couldn’t face it as I was feeling really sore and very tired, so I opted out and stayed behind in the tree house, Sam kept me company. The others returned having not seen any Gibbons and breakfast was then served which included tomato omelette, chips, sticky rice, tomato salsa and fresh green mango which I have to say is delicious. So it was time to head back which included a very steep hike down where I fell over and cut my elbow and some more zip lines. This time we managed a zip which was 400m high and 600m long and it was just amazing. On the last zip of the day I think Sam got a bit excited and ended up doing a 360 degree spin and at one point found himself zipping backwards. In his efforts to regain control, he brushed his arm against the wire and now has a nasty burn but he is being very brave about it. We had an amazing two days. The zip wiring was brilliant and so much fun. We had a great local guide too which made all the difference and he told us stories of his childhood, where his family were opium growers and lived off the jungle. When the government banned the growth of opium, the family had to move to another village and he got involved with the Gibbon experience which has been going for about 10 years now. 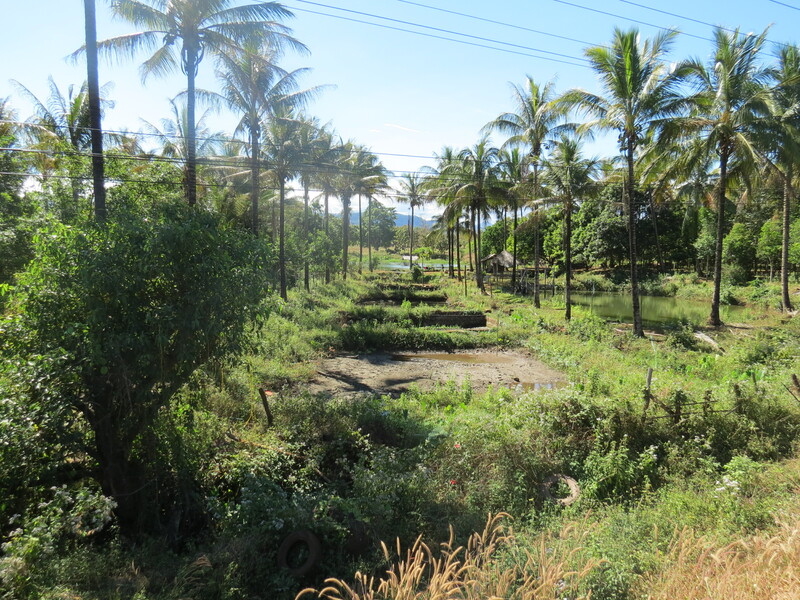 We returned to Houy Xai at 14.50 and we were in Thailand by 15.30…pretty amazing but quite stressful. We then got a bus to Chiang Rai where where we spent three nights, mainly recuperating and relaxing. 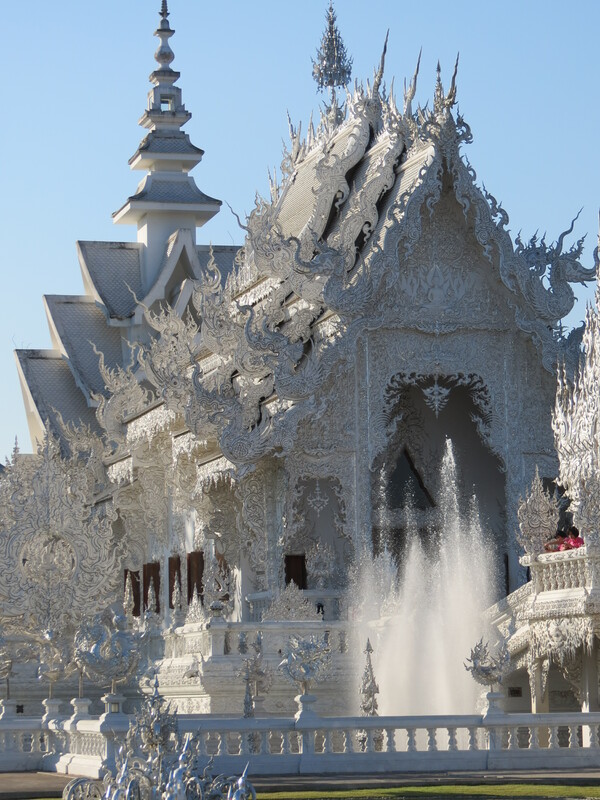 We did go and see a White Temple, which was pretty strange and very different to any other temples we have seen. Since then we have moved on to Chiangmai where we have met up with Seb and Sophie again. So far we haven’t done too much as I’ve got a throat infection and am having to take antibiotics. Sam is looking after me and has just made me go out to have some soup, so I am hoping it will clear up soon so we can actually see some of Chiangmai. Our journey to Vientiane involved a night sleeper bus which took about 11 hours. The beds were actually supposed to be double beds, but they were actually barely the size of a single bed. I wouldn’t say that we got the best night’s sleep, but it was a fun way to travel. We were still travelling with Seb and Sophie, and after a long night and some much needed breakfast, it was up to the boys to find a room. Although Vientiane is the capital of Laos, there is very little to do. 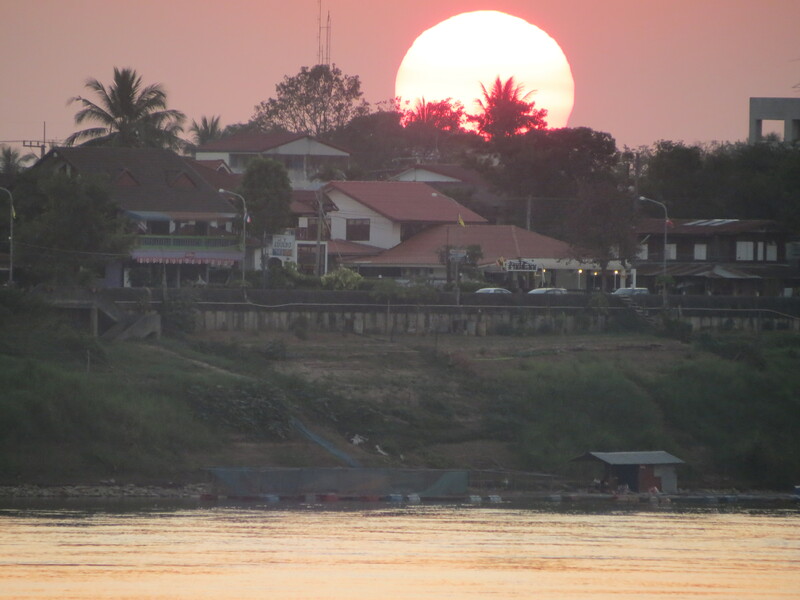 It overlooks Thailand on the other side of the Mekong River, and we found a good spot to see the sunset and relax. The climate here was noticeably colder than Southern Laos, especially in the evening. 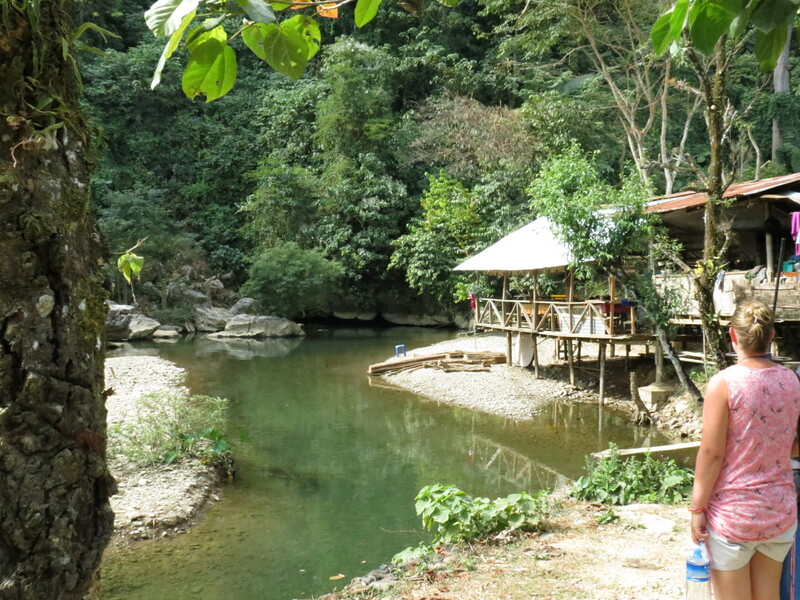 As there was so little to do, and before we put on two stone from eating too much, we headed North-West to Vang Vieng. 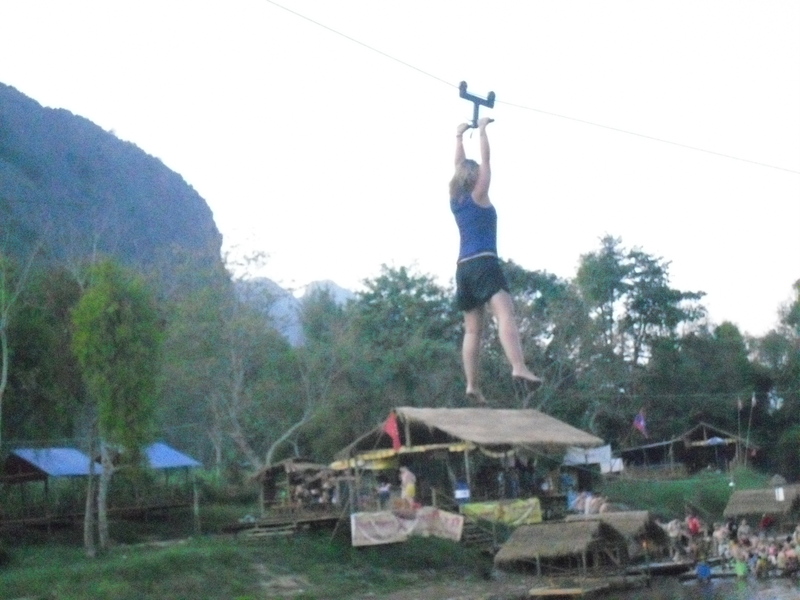 Vang Vieng is a very different place to everywhere else we have been so far on our trip. It is famous for tubing, which involves floating down the Namsong River in an inner-tube, stopping at various bars along the way. Although this may sound fairly tranquil, in reality it is a very different thing. There were five of us now as we had met up with Julianne, a Canadian girl we had met in 4000 Islands. Each bar entices you in by throwing ropes to you as you float past, and free shots of whiskey are almost compulsory as you walk in. It’s a really lively crowd of mostly very young people, dressed in either very little or fancy dress. It did make us feel slightly old, but I think we held our own. In the entire day we must have floated a maximum of two hundred metres down the river. For the rest of the time we were busy drinking, dancing, zip-wiring into the river, some more drinking, then some more dancing…then we can’t remember too much. The plan to tube the 2km downriver to the drop-off point went out of the window. Katy and Julianne’s dancing alerted me that they may have had one too many whiskey buckets, so we headed back to town. Within ten minutes of getting back, Katy had passed out on the bed, giving me a night off and time to get some food. The next day was pretty much written off after our previous day’s escapades. As we spent the whole day doing very little, we decided that we would go kayaking the next day. It was an early start, and first we headed about 18km out of the city to see some caves. The first (The Elephant Cave) was a bit of a disappointment to be honest, but when we arrived at the second cave we had a bit of a shock. There was a tiny opening, and it was filled with water. We got in the freezing cold water with our tube, and squeezed into the small opening. The cave was pitch black other than our head torches that had been provided, and it was quite an eerie place. There were only four of us, and it was great not having to do it in a huge group. The cave went on for about 1km underground, and we were able to use ropes for most of the way to pull us along. The guide told us that the cave used to house thousands of bats, but there weren’t many left and most of the locals catch them to eat. Especially good on a BBQ apparently. After a nice BBQ lunch (which hopefully wasn’t bat), we then headed downstream in our kayaks. After a few minutes of bickering, we quickly got into our stride and took in the stunning views of the surrounding mountains. In total it was about 10km, and the route happened to go through the tubing circuit. We decided that after all of our hard work, we would reward ourselves with a few beers at one of the bars before heading back to our hostel. 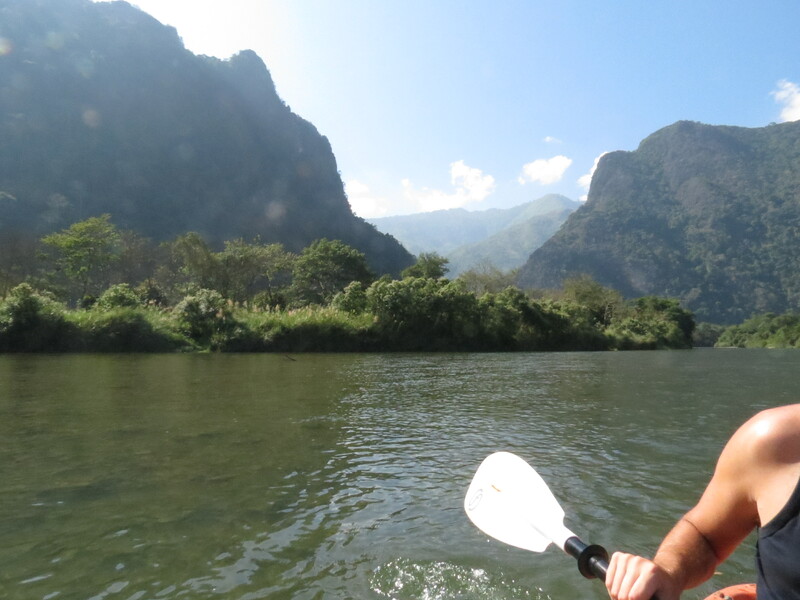 We spent a total five nights in Vang Vieng, and we did very little for the remaining days after kayaking. Katy got to do some of his customary shopping and map checking before we departed for our next stop, Luang Prabang. The bus there was a seven hour drive winding through some stunning mountains. Some of the corners were a bit too tight for my liking, but the bus driver didn’t seem too concerned. Apparently brakes are just for stopping. We’ve been here two nights so far, and it is a really beautiful city. There are loads of places to eat, drink and relax with views over the Mekong. It has a very French feel, with most of the guesthouses and restaurants having colonial designs. 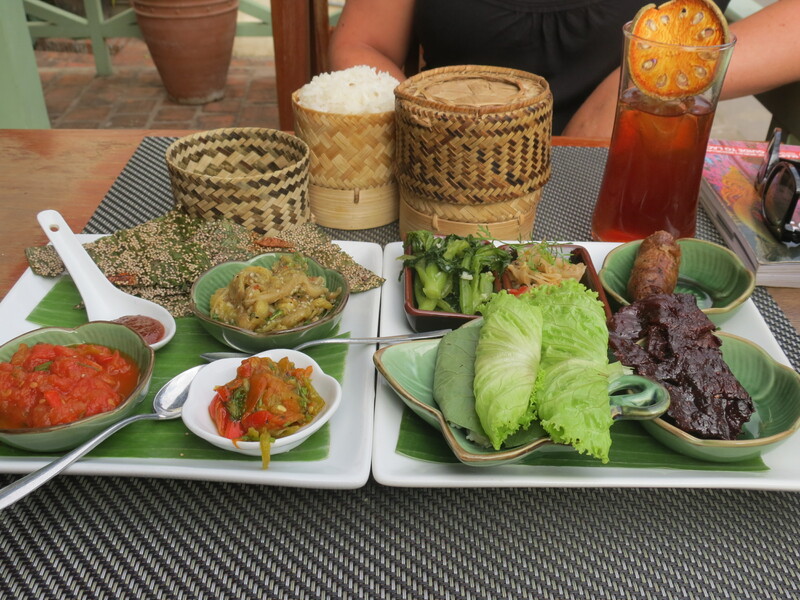 As we have eaten very little Laos food since we’ve been here, we decided that we needed to make a bit of an effort. We found a restaurant that offered a sampling menu, where we could try all of the local delicacies. There were some quite strange bits in there, but nothing too out there. Last night we went out to watch the Bolton vs. Man U game (which wasn’t the best), and then went to the only place in town open past 11:30pm…the bowling alley. It’s about 2km out of town, so eight of us piled into a tuk tuk. It was quite a funny night, and I managed to get a score of 137 which is unheard of. I think that’s the first time I’ve got over 100. 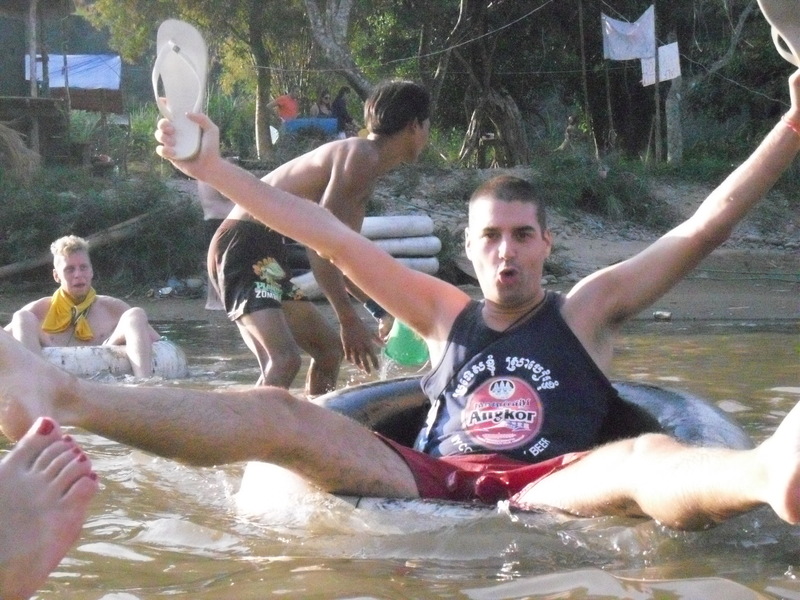 It must be the Beer Lao. We’ve decided that rather than get a 14 hour bus to our next stop, Huay Xai, we are going to get a two day slow boat down the Mekong via Pak Beng. That way we will get to see more of the country before we leave for Thailand in a week or so. 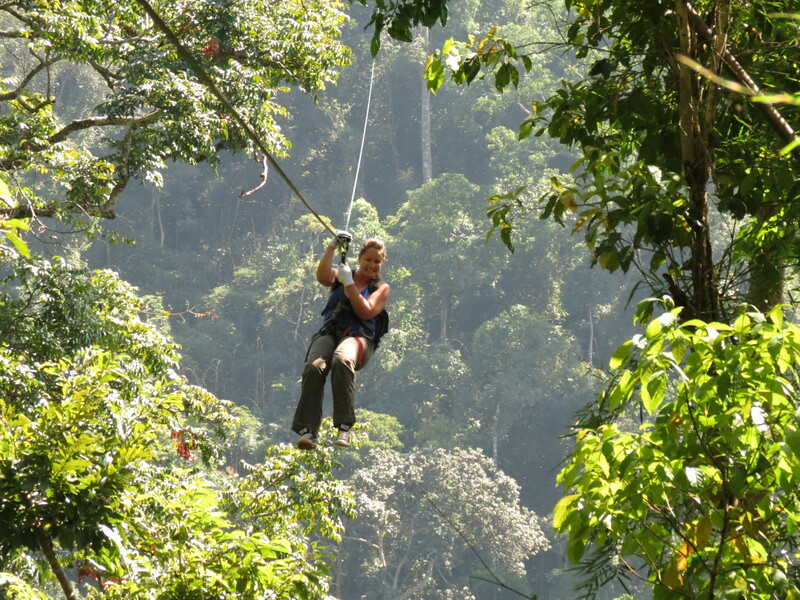 In Huay Xai we are heading into the jungle to stay in a tree top hut and do some zip-lining. Hopefully we may get to see some gibbons and other wildlife, but we’ll have to see what happens. I could throttle Katy; in fact I could puncture! 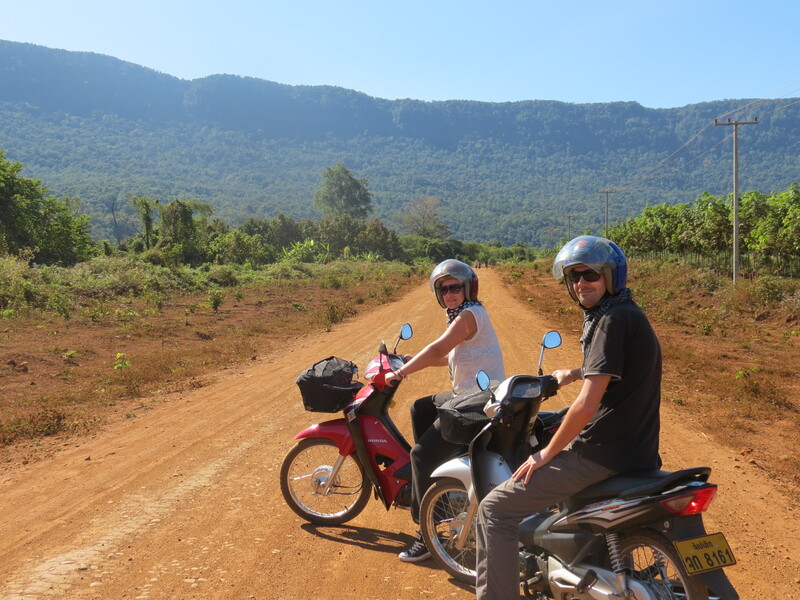 We had an early start on New Year’s Day, and after breakfast we were ready to set off on our tour of Southern Laos. As it was our first time on a bike, Katy and I rented small 100cc bikes, while Seb and Sophie had a bigger dirt-bike to share. We headed East out of Pakse towards Tad Lo, which is about 85km away. It’s a fairly simple trip on good roads with very little traffic. After a pit stop about 15km in, we’d arranged with Seb and Sophie that we would meet them at Tad Lo, as they were more likely to get there first. We set off first, expecting to see them fly past us at any minute. An hour later there was no sign of them, and we were unsure of whether to turn back and look for them or carry on. We decided that it was probably best to carry on and get to the guest house in Tad Lo where we had arranged to meet. 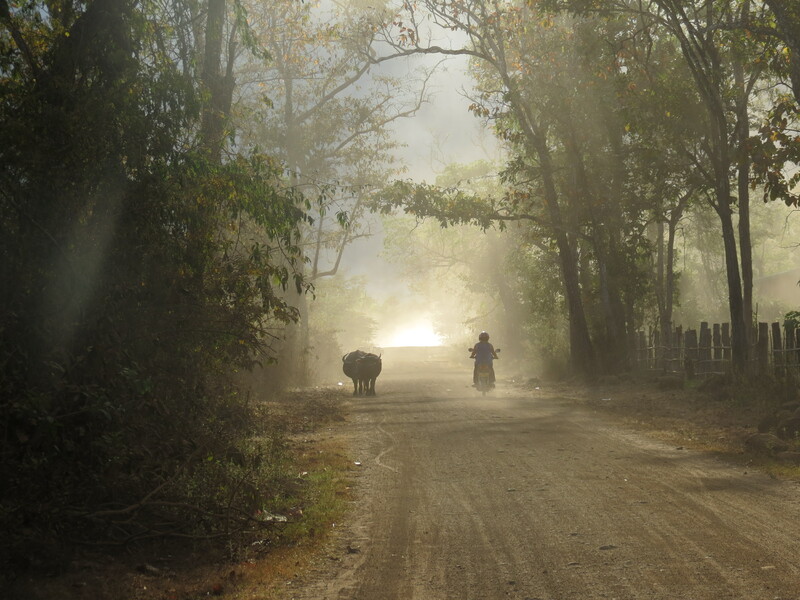 The ride on the way was really good, and we passed through loads of small Lao villages. There were very few road signs, so we kept an eye on how many kilometres we had travelled so far so we would know when we were there. Anyway after 90km, there was still no sign of Tad Lo, so we thought we had gone past it. We back-tracked about 15km to have another look. At this point there was still no sign of Seb and Sophie, and we began to have visions of us stuck in the middle of nowhere, with no way to contact them. We eventually found someone who spoke a little English, and we were told that Tad Lo was 20km back in the direction we had just come from. So we turned around and started again. It turns out that the turning for Tad Lo was about 5km from where we had originally turned around in the first place, but we were pleased to find it. Tad Lo itself was a very small village next to a waterfall, and when eventually found the guest house there was no sign of them there, and the owner said there were no English couples that had arrived recently. We were worried that something had happened to them. Ten minutes later they turned up though. When we had left them their bike hadn’t started, so they were stranded in a tiny village. The locals sat them down, gave them food and beer while someone had a look at the bike. After an hour they found out that it was simple a switch at the top of the bike that needed to be pressed, and they were back on their way. After a trip to see another waterfall in Tad Lo in the afternoon, we headed to a local restaurant that is famed for its good food at cheap prices. The owner (Mama Pap) told us that she was having problems with one of her guests; an Italian guy who was refusing to pay his bill. Katy and Sophie agreed to try and broker a deal. After an hour of negotiating, he agreed a price that both he and Mama Pap were happy with, and we headed to bed in our very rickety bungalow. The next morning we set off to a small town called Sekong, South of Tad Lo. About an hour into our journey, Katy pulled over with a puncture. We were in the middle of nowhere, with only very remote villages around us. A group of locals quickly joined us on the side of the road, but nobody spoke a word of English. Thankfully we found a local family that could change the inner-tube for us just five minutes down the road. We pushed the bike up to their house, and sat there for an hour or so while he repaired the tyre. We had no idea how much it would cost us, but we were shocked when we came to pay and it only cost about $2. So we were back on the road to Sekong. It didn’t take us long to get there, but when we arrived we found that there was virtually nothing there. 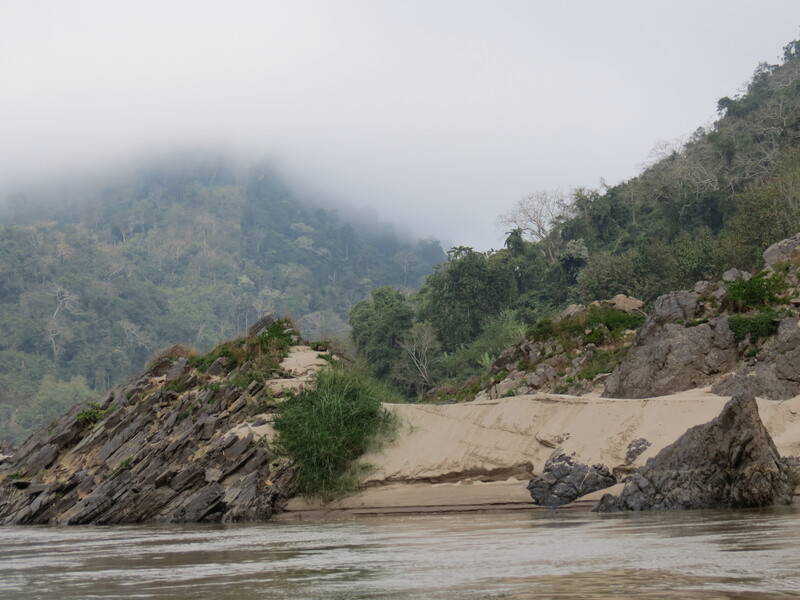 According to our guide book, this is one of the most remote parts of Laos, and that was fairly obvious to us. There were no other tourists to be seen, and most locals looked at us as if we were from Mars. Food was very basic with very few English menus, so we had to go with whatever we were given. While we were eating lunch, we were surrounded by various animals just wandering around, including pigs, chickens, cats and dogs. It was quite a site, and we turned around to see a chicken stood on Katy’s bike seat taking a poo. To say Katy wasn’t pleased is an understatement. We went to see more waterfalls that afternoon, before having an early night. The next morning we got an early start, as we were headed to the most difficult part of our trip. So far all the roads had been tarmacked (to a certain degree), making it a fairly easy ride. That days trip involved heading to Paksong through the Bolaven Plateau (a national park) on a 90km strip of dirt track. We didn’t really know what to expect, but when we got to the track we were slightly worried. It took us an hour to do about 17km, with the roads proving almost impossible for our little scooters. So we took a stop at a couple of waterfalls to have a bit of a break from the bumpy road. When we got back on the road we found that the track improved, and we made up some time quite quickly. There was virtually nothing on the way except beautiful views all around us. We were thankful to find a tiny little shop where we could buy some lunch (if you can call it that). We were treated to some stale coconut biscuits and water. By this point we were covered in dust and dirt from the road, and the locals were looking at us as if we were mad. We’d only seen one other foreigner driving across the plateau, so it’s obviously a fairly un-travelled route. After several kilometres of huge dust clouds and precarious gravel causing the back of our bikes to swing out, we made it to Paksong. 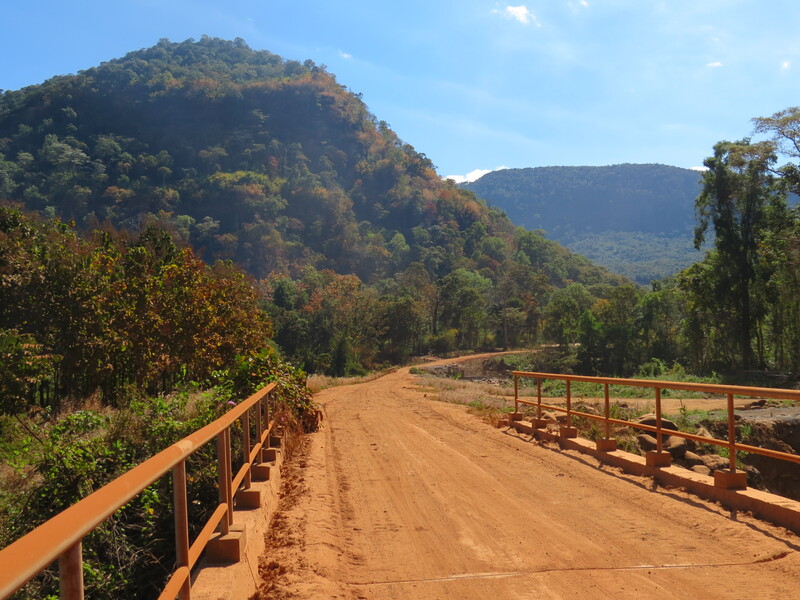 There was very little there, and we were only 50km from Pakse, so we decided to carry on. In all we travelled about 400km in three days, and it was an amazing experience. I think we were all glad to get off the bikes and give our bums a rest though. When we got back last night, we treated ourselves to a hot shower and nice curry. It was great to see parts of Laos that a lot of tourists don’t get to see, and we were pleased to arrive back safely. Tonight we’re heading North to Vientienne where we plan to spend a couple of days.